Fiona Ingram, author of the middle grade adventure novel, The Secret of the Sacred Scarab, is stopping off at Blogcritics on Day 3 of her virtual book tour with Pump Up Your Book! Read her interview at http://blogcritics.org/books/article/interview-fiona-ingram-author-of-the1/! A 5000-year-old mystery comes to life when a scruffy peddler gives Adam and Justin Sinclair an old Egyptian scarab on their very first day in Egypt. Only when the evil Dr. Faisal Khalid shows a particular interest in the cousins and their scarab, do the boys realise they are in terrible danger. Dr. Khalid wants the relic at all costs. Justin and Adam embark upon the adventure of a lifetime, taking them down the Nile and across the harsh desert in their search for the legendary tomb of the Scarab King, an ancient Egyptian ruler. They are plunged into a whirlpool of hazardous and mysterious events when Dr. Khalid kidnaps them. They survive terrifying dangers in a hostile environment (such as a giant cobra, as well as sinking sand), pursued by enemies in their quest to solve the secret of the sacred scarab. They must translate the hieroglyphic clues on the underside of the scarab, as well as rescue the missing archaeologist James Kinnaird, and their friend, the Egyptologist Ebrahim Faza, before time runs out. They must also learn more about the ancient Seven Stones of Power and the mysterious Shemsu-Hor. 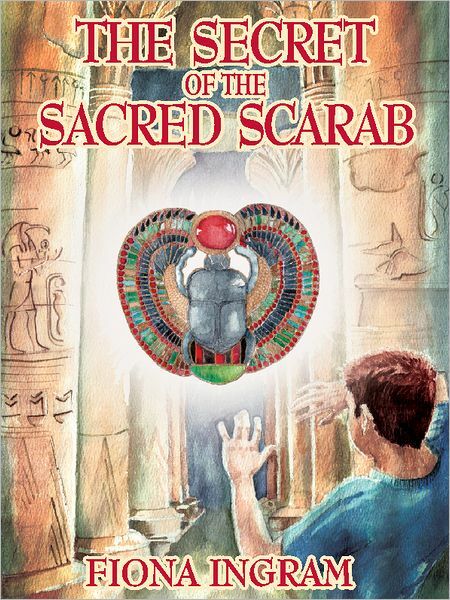 With just their wits, courage, and each other, the boys manage to survive … only to find that the end of one journey is the beginning of another!Young explorers will enjoy an interactive journey through Egypt, following Justin and Adam’s exciting adventure on www.secretofthesacredscarab.com. Readers can also browse the first chapter of the book. Those who survive the journey and manage to translate the Curse of Thoth will be able to read the first chapter in Adam and Justin’s next adventure—The Search for the Stone of Excalibur—as they hunt for the Scroll of the Ancients. Visit Fiona’s website at www.fionaingram.com.